Click on the thumb and go buy the book! 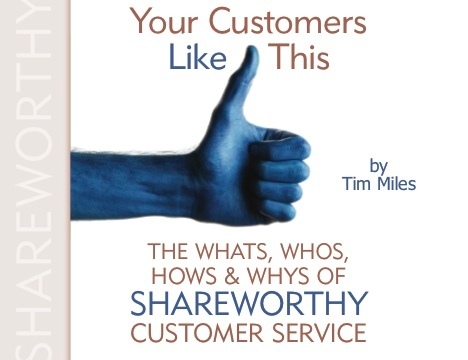 Seriously, Tim wrote the book on shareworthy customer service. It’s pretty awesome and right now, it’s pretty inexpensive. In fact, Tim is only asking a donation of 99-cents to benefit Touchpoints Central Missouri Autism Project. You should grab it before he changes his mind. Did I say it’s awesome? Yes. Yes, I did. This entry was posted in Books, Customer Experience, Wizard of Ads and tagged Customer Service, Tim Miles on March 28, 2012 by Dave Young.